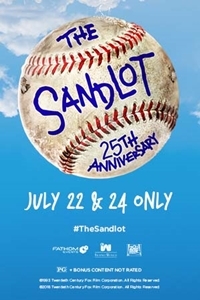 Fathom Events and Twentieth Century Fox are bringing The Sandlot 25th Anniversary to select cinemas nationwide for a special two-day event, with a sneak peek of a documentary on the making of The Sandlot! Play Ball! It's the early 1960's and fifth-grader Scotty Smalls (Tom Guiry) has just moved into town with his folks (Karen Allen and Denis Leary). Kids call him a dork --- he can't even throw a baseball! But that changes when the leader of the neighborhood gang recruits him to play on the nearby sandlot field. Soon nine boys have become best friends, Scotty is part of a team, and their leader has become a local legend in this hilarious and warmhearted comedy.